Happy New Year 2014 to all my readers. I am doing my 2nd post of my favorite products of the month. 1) Koleston hair colour – I have been colouring my hair for about 2 years now and I prefer doing it at home as I really dont trust much salons in hair colouring as they keep adding stuffs to the hair and it gets dry and brittle. Its not like I haven’t coloured or highlighted my hair in the salon I have done full head highlights , crown highlights and colouring my bangs but then I realized that my hair started to break alot. 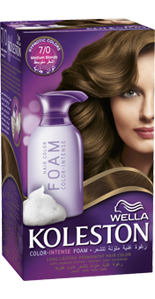 Koleston is a product I have been using for about 2 years now and I really love it, it doesnt make my hair dry or brittle. The best part about this is its in a foam style. 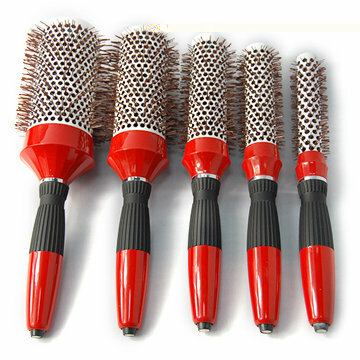 You can use it as if you are shampooing your hair. You got to leave it for 40 mins – 50 mins depending on how deep you want the colour to be (but do not keep the colour for more then 50 mins as it can damage the hair, read the instructions if you are not sure). One thing you will notice that after the application you might not find or find a very little difference in the colour but not to worry as after each wash the colour enhances and gets more prominent which is what I love about it. I use the colour 7/0 medium blonde. 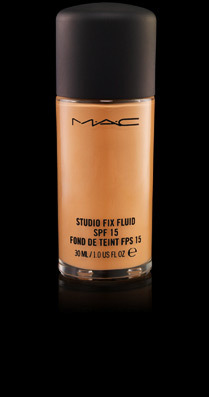 3) MAC Studio Fix Foundation and Powder foundation (Compact Powder)- I started to use MAC cosmetics in 2011 and since then no looking back. I love how it create an even canvas to the face. It is a full coverage foundation and the compact is semi coverage. If I need a more sophisticated look I use both the foundation and then compact to set the look and if I need just a simple everyday look I just use the compact powder (it doesn’t covers all the blemishes and dark circles but lightens it to an extent, but if you want you can conceal your blemishes and dark circles and then set it with the powder). I am a NC 42 in foundation and NC43.5 in the compact powder. 4) Sleek 3 in 1 Blush in Pumpkin – I am in love with the blush palette as it has 3 colours Orange, Red and Pink. It is travel friendly and you dont have to think to carry individual blushes as these colours can go on everything just mix and match. They are so pigmented that you have to be careful when you apply as you can end up having a lot of the product on your face. This product is so amazing that it speaks for itself. ‘ That’s all for my December favs. PS all the pictures are from google. As you must have all read in my last months post that I will be starting a new post which I will be updating my monthly favorites so here is my 1st post for the Month of November. 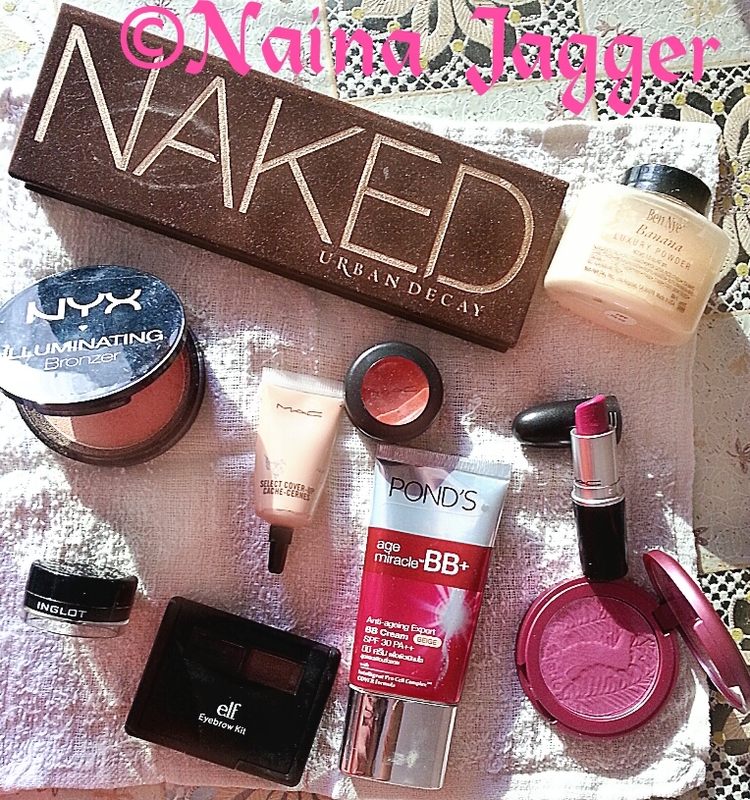 I have 10 products which are my favorites for the month of November. I am sure out of these I will be repeating few products again and again (LOL). Brows – We all know how essential it is for our eyebrows to look tamed and sometimes we do need to fill in some gaps and give it a clear crispy look. I use the E.L.F eyebrow kit in Dark. It has a wax and a powder after sketching the outline and filling in with the wax we can set it with the powder so it remains intact the whole day without needing to retouch it and avoid it from smudging. Eyeliner – All time favorite Inglot gel liner in Black number 77. I haven’t seen anything as black as this gel liner I call it JET BLACK. Other best thing about this product is waterproof. 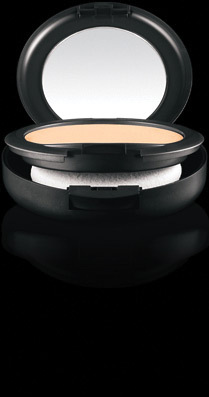 Concealer – I do have really dark under eye circles and if I don’t do any makeup I do have to at least conceal them. I use MAC orange studio finish corrector to counterbalance the deep bluish hues and after buffing it well I use the MAC Select cover – up in NW 35. I prefer the concealer to be same colour as our skin tone and not too dark or too light just to give it a natural look. As too dark can make it look as if we had a bruise and too light can make the under eye look to greyish or ashy. BB cream – I have tried so many BB creams (samples) from MAC to G arnier to Body shop but couldn’t find the right colour as most of them are pink undertone and I have a wheatish complexion I need a yellow or orange undertone for it to look more natural. Some BB creams can be really oily as its a mixture of moisturizer and SPF. But finally I found a really nice BBcream which suites my tone (I am a NC42-NC43) and its’ not that oily too. Ponds Age miracle in Beige (They have a Pond white BB cream too if you are not looking for an anti aging product). First when you apply it you might feel it a little light but it takes few minutes to settle down and once settled it matches your skin tone. Ben Nye Banana Powder – I really love the texture of this powder you can either use it to set your makeup or just set your concealer (can be used on your T-Zone also) this can be used as a highlighter too. I remember reading an article in which they mentioned that Kim Kardashian uses this as a highlighter under her eyes. Blush – Tarte Amazonian clay blush in Flush is my absolute favorite and I find my self using this product every time. I just love how the colour looks. If you need a little OOMPH to your checks rather a rosy fresh look (Its not rosy tho its a pinkish purplish colour) this blush is the best. It is perfect for Winter and Summer. Highlighter – If you require a little more glow and want to make your face look fresh NYX Illuminating bronzer in Narcissistic is the best. If you have been checking my pictures on my Facebook page you would have noticed that I use only this highlighter.